Otto Kahn, owner of 'Oheka' designed by Delano & Aldrich c. 1915 in Cold Spring Harbor, seen later in life (unlike yesterday's photo). Click HERE for more on 'Oheka' and HERE to see the brochure from when 'Oheka' was for sale. Click HERE to see Kahn's New York City residence. Photo from the Library of Congress. There are blogs out there where Kahn's jacket alone could elicit a hundred different posts. I'm just glad to see he knew where the lifeboats were. I take it he is not pictured here on the deck of his famous German built yacht of the 1920s, the Oheka II? why was the house only $75,000? houses one tenth of the size were selling for much higher prices around the same time. Because the acquisition cost of the house was just the beginning of the story. Once you bought the house, you faced the additional (greater) cost of furnishing it appropriately, the ongoing (and enormous) expense of staffing and maintaining the house and grounds, plus taxes, insurance, etc. "Ordinary" rich people made much less. Here -- unfortunately, for NYT subscribers only -- are three stories from the Thirties listing the incomes of high-earning individuals, in New York and elsewhere in the U.S. This suggests the potential buyers for a house such as Oheka were virtually non-existent. The largest house in our little town, 30 rooms, with 10 bathrooms piped for salt and fresh water, stone and shingle, built like a fortress, cost 75,000 to build in 1913. The payroll for the staff of 12, 9 live-in, was likely under 15,000. See where this is going? The Stotesbury house at Bar Harbor, the summer Whitemarsh Hall, built 14 years later, 55 rooms and gold leaf as far as the eye could see, cost 368,000 (despite all the accounts in Stotesbury bios that say a million, the above is the true figure. Less than 20 years later, after a depression and war and higher income taxes, it sold for $46,000. The next owner let it go for taxes four years after that. These stories of just two huge houses in my region, are duplicated all over Long Island and anywhere else large houses sprouted---the trajectory is rarely different. 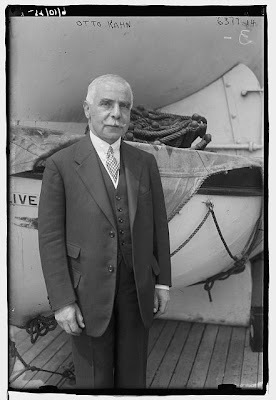 slightly more on topic, I just read a memoir of summer life in our town during the 1920's, when the summer colony here included Kahn's brother Felix--it includes an account of Kahn arriving on Oheka II, not even one of the large yachts of its day, but still to big to come into the shallow inner harbor comfortably. I was looking around last night to see if I could find the source of the horse picture. Didn't find that, but I did find an intriguing photo of Mr. Kahn with Douglas Fairbanks Jr and Charlie Chaplin --no explanation why he was with them. They make an interesting trio, couldn't be more different from each other if they tried. Was OHEKA furnished when the Welfare Fund of the Sanitation Workers (retirement home) acquired it? The article below says the Fund paid $50,000 to furnish it. I appreciate the additional info - the NYT's pay firewall does curtail some of my deep dives into info these days. Amazing that truly the masses (3,000 per the Times article) poured onto that Cold Spring Harbor estate at one time, a Military school discharged shells on the grounds, yet when when Gary M. wanted to make the place into the venue it is today two decade ago there were community objections. I've read conflicting info on the current ownership - does an unnamed Japanese investor own the property today? While reports suggest that D&A weren't happy with the design they put forth I have to say externally it works for a grandiose monument. Not my favorite yet I can appreciate it as a castle of the Gilded Age. Zach, off topic yet again but do you know if Château des Thons did actually transfer ownership with last year's auction? The auction cite listed it as having 'sold', but it appears to still be on the market. Any idea? I love seeing this place every week on TV; the indoor pool is nicely done up. I seem to recall a rumor circulating at the time Gary stepped up that the Eastern Military Academy not only butchered the property and neglected it, but that a pair of tanks had been buried in the formal garden; apocryphal, I'm sure, as I cannot imagine what would possess a financially strapped institution to teach the student body how to inter expensive military equipment. "...curiouser and curiouser," Alice said. DED, in the words of the infamous Patsy Stone, "I condole you..."
But seriously, I am sorry for your recent loss; it's never easy. Yes DED, I also wanted to express my condolences, I also recently lost my Father, Sister and a very close Aunt. It's never easy, no matter the age, I wish you and your family the best. As for Oheka, I'm tempted to take the tour...but it kind of pricey. Does anyone know if the gardens are on par with Old Westbury or Planting Fields? Thank you for the kind thought lil' GB. You can never have too many hats, gloves, and shoes. Anonymous, my condolences to you. There will be an open house at Oheka Monday, April 16, 2012 at 7:30pm. You can join the friends of oheka for as little as $2 as a student and $10 as a friend or $25 for a family. You are allowed to roam the house including the gardens. The gardens have been recreated and now you can see Cold Spring Harbor from the back of the house. Mark PS There will also be a garden party on wed june 13, 2012 for a charge. Pick up Ellen Schaffers Oheka book on E bay if you can. Here are some pictures of Oheka during the,"Occupation"!